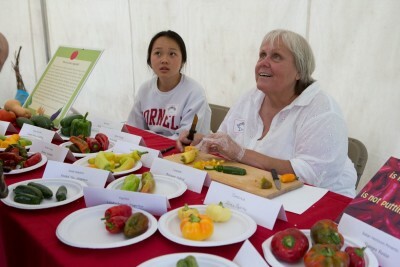 We’re celebrating Peppers at Cornell Plantations! Join us for a party featuring peppers galore at this afternoon of learning and merriment! Meet Dave DeWitt, “The Pope of Peppers”; help name a new pepper bred at Cornell, learn to dance the salsa with live music, taste some fresh and roasted peppers, sample pepper-flavored chocolate, and enjoy pepper crafts and activities for kids of all ages. For more information on the Plantations Pepper Party, go here. Dave DeWitt, author and foremost world authority on chile peppers, spices, and spicy foods. He will be manning the Chile Pepper Aroma Therapy Booth, where people can detect the smells of different varieties.